A few Mixbook team members (in additions to millions of viewers worldwide) have started watching the new Netflix show Tidying Up With Marie Kondo, and all we can say is wow – we’re inspired! From learning how to intentionally fold clothes and parting ways with them (thank you sleep shirt from 1999), to ridding yourself of things that don’t spark joy in your life (or self), Kondo’s KonMari tidying method has transformed people’s homes and lives. 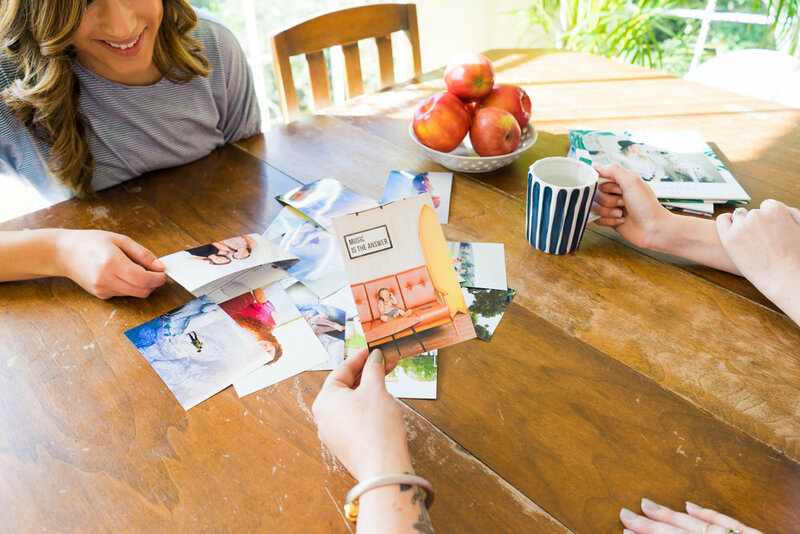 One thing that really resonated with us is the KonMari method for organizing photos. Many people have boxes full of old photos – some in albums, others loosely stored. But what do you actually do with those photos? That’s where the KonMari method comes in. The first thing to note is that photos are part of the fifth and final category in the KonMari method – the mementos (sentimental items). Start easy with things like clothing and books, and end with the more difficult categories to keep you from getting stuck in the beginning. While it may sound like a lot, it’s totally doable! Kondo recommends that you go through each photo one by one and only keep those that truly spark joy for you. The easiest way to organize the photos that you decide to keep is grouping them by year. Another thing Kondo suggests is taking what sparks joy and displaying it for you and your guests to see. That’s where Mixbook comes in. Photo books, calendars and wall décor are all beautiful ways to bring these memories to life and put them on display for yourselves and guests to cherish and admire. Photo Books – Create a year in review photo book for each year of organized photos. Display these books on the coffee table, bookshelf, or other areas for you and your guests to thumb through. Calendars – Share some of your favorite memories in a customizable calendar. Calendars can be displayed in your kitchen, office, or bedroom to spark a little joy every time you see them. Wall Décor – For those photos that bring the most joy to you, it may be worth getting them printed on a nicer canvas or acrylic to be displayed on the wall. Part of the method is about organization, but an even bigger part of it is about finding joy. Memories that bring joy to your life deserve to be displayed, not hidden away in a box. Have you tried Marie Kondo’s KonMari method for organizing photos, or methods of your own? Do you plan to? Let us know how it went or how you plan to tackle your photo organization in the comments below!